After spending the night in my tent at a sheep farm/cat refuge and being woken early by a gang of magpies I made my way to The Model, Sligo for Susan Hiller’s first comprehensive Irish solo exhibition (12th July – 21st September). I had recently become interested in the artist’s work, in particular her focus on cultural heritage. Her retrospective gaze is, in no small part, due to her previous life as an anthropologist. Now with some 40 years experience as an artist a retrospective look at her portfolio highlights the successful transition into contemporary art without the need to jettison what had been learned before. This is both relevant and inspirational for me, having left archaeology two years ago. Belshazzar’s Feast, 1983-84. 20-minute single-screen installed video programme. The exhibition at The Model features a number of key pieces dating from 1983 to the present time. 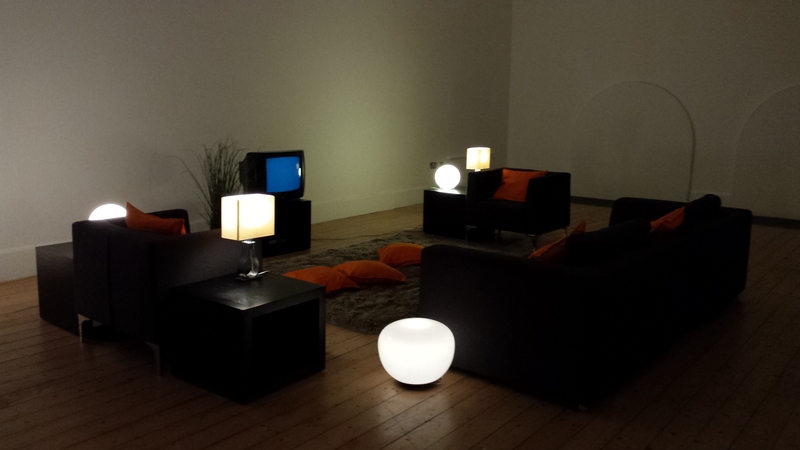 Belshazzar’s Feast (1983) is set up like a living room and there is nothing on TV except flames and an account of reported experiences of people seeing faces and hearing voices in the tv static after close-down. Hiller reports the stories in documentary style but in a whisper as if telling a ghost story. The experience for me on the day was interesting, relaxing and amusing. The Last Silent Movie (2007) features a projection screen with little on it but some subtitles. The main focus here is the sound, which features recordings of very random lines or words of various extinct languages being read out. The sound piece is accompanied, in an adjacent space, by 24 etchings, each one showing a visualization of the spoken word in the form of a graph e.g. Plate 24, COMANCHE, From now on we will speak Comanche forever. This tendency to back up one mode of delivery with another seems to feature a lot in Hiller’s work and is more in keeping with anthropological documentation than the vague and minimalist approach of contemporary art. The non-video elements of The J Street Project, 2002-2005. The J. Street Project (2002-5) is a catalogue of street names in Germany that feature the word ‘Juden’. There is a list, a numbered map, photographs and a 67 minute video piece. There is nothing wrong with being thorough! Of the various components the video piece is the most effective, despite the poor resolution in which it was shot or reproduced. There are many instances where the everyday and incidental in the film become very symbolic. A number of crucifixes feature in the footage as do fences with barbed wire and people with dogs. Some buildings seem sinister. The suns sets in a rural scene and one is left feeling uneasy. A car approaches on a country road at night and one remembers countless war movie incidences of escape and capture. The street name ‘Judengasse’ features prominently. It is interesting that despite the photographs, map and list documenting the project accurately it is the artistic treatment of the video that has the most impact. The shots are from a static position. The action is not planned. Random occurrences make the most successful scenes e.g. an old man having his hat blown off by a passing truck. Anthropologists and archaeologists don’t video a space in order to record qualities such as absence, anteriority and hidden significance, but perhaps they should. 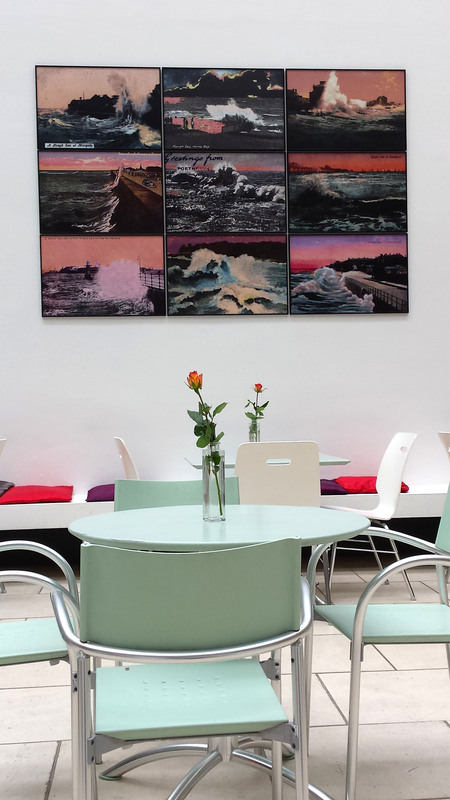 ‘Rough Seas’ (1982) in the atrium. Rough Seas (1982-) makes a colorful addition to the Atrium but its impact might be lost without supporting information. The previous incarnation of this piece at the Tate seemed far more comprehensive. Nine songs for Europe (1991-5) is a striking installation but it’s meaning was lost on me. I have not been able to find anything online to shed any light on it. The Curiosities of Sigmund Freud (2005) comprise of a set of 9 Iris giclée prints on Japanese hand-made paper, based on eight uncatalogued glass slides from the Freud Museum, London and a letter written by Sigmund Freud. These are strangely beautiful in their obscurity. The ones that are zoom-ins of larger photos are, to me, a bit sinister. They remind me of photographic analysis carried out by those investigating war crimes committed during the holocaust. In particular they remind me of Bracha Ettinger’s painting ‘Eurydice, no. 23’ (1994-1998). 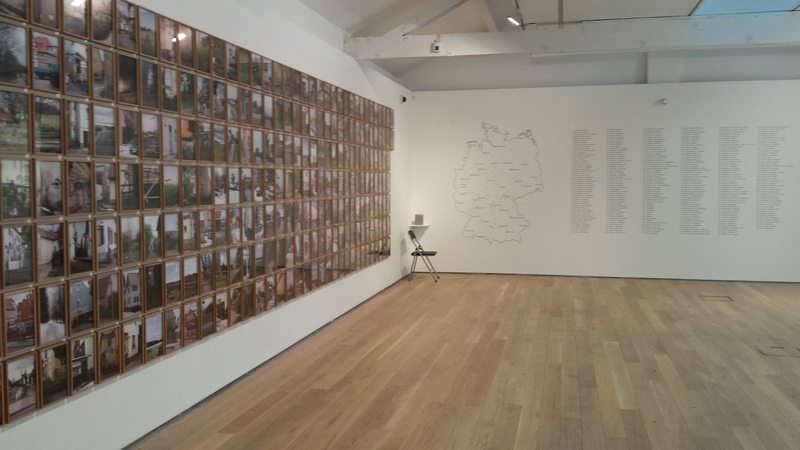 It was certainly worth the trip to Sligo to see this exhibition by Susan Hiller. I was very sorry not to have been available to attend the opening of the show during which Hiller participated in a public conversation with critic Francis McKee but I have been told that it will available to view on Youtube in a couple of weeks.